Opposition councillors at Northamptonshire County Council are calling for leader Matt Golby and some other senior Conservatives to stand down after another severe financial warning was issued at the authority. The calls came after chief finance officer Mark McLaughlin issued another 114 notice today saying there is a budget shortfall of up to £70m. His report issued to councillors this morning says that over the past four years financial decision-making had been ‘factually wrong, ill-informed, out of step and inappropriate’. Now leading councillors say council leader Matt Golby, who was part of the cabinet during those years, should stand down. Cllr Golby took over as leader after Heather Smith resigned in March. Leader of the Liberal Democrats Chris Stanbra said: “Matt Golby now needs to consider his position, as do cabinet members Cllr Michael Clarke and Cllr Ian Morris. Cllr Golby was deputy leader before and has been in the cabinet for many years. 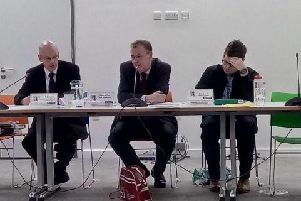 Cllr Clarke and Cllr Morris were also in the cabinet and so would have been involved in making these decisions. Cllr Golby joined the cabinet in 2015 and Cllr Clarke has been in the cabinet since 2014. He was replaced in 2016 but returned to the cabinet this year. Cllr Morris has been a cabinet member since 2017. The council was led by Jim Harker during much of this time, until he retired in 2016. Chairman of the finance scrutiny committee Cllr Mick Scrimshaw said: “Clearly Matt Golby was a leading part of the cabinet and knew what was going on. Cllr Scrimshaw said if a 114 notice had been issued a few years ago by the then chief finance officer Matt Bowmer then the council may not have been where it is today. He said: “It was a mistake not to issue the notice. I would like to see some ex-councillors and former council officers return to answer questions. Cllr Stanbra said the current financial situation at the council was so serious that he did not know how the authority was going to make the required savings. The £70m shortfall figure published today is double what had been previously expected. Details of further cuts are expected at an extraordinary meeting on August 1. Cllr Stanbra said he thinks compulsory redundancies may now be on the way. Two government commissioners are overseeing the authority and today (July 24) finance commissioner Brian Roberts said no extra money was coming from central government and that the time for difficult decisions has come.